The Place If you have been to Mandarin Gallery lately, it is difficult to miss the latest new cafe in town, yes yet again. Our bustling cafe scene has never been more exciting, especially with the opening of The Providore. I was highly anticipating its opening after hearing that it is run and conceptualised by the guys behind Jones the Grocer, which is one of my favourite cafes as well. Other than offering food, the house brands are on sale as well, such as The Providore tea, coffee beans, sauces, chocolates and even made-in-Japan tea cups. To find out more on The Providore’s retail concept store at Tan Boon Liat Building, do read our snippet on it too! The setting of The Providore is open concept dining, and it is a merit that there is a communal table for big groups, private tables for couples and high-seat bar tables for the solos. So fret not if it is a day where you feel like having a coffee and reading a book by yourself. The Food What is a cafe without THE Brunch menu? Watch out the neighbouring Wild Honey, I am very certain The Providore is going to give Wild Honey a run for their money. Note that brunch is only served on weekends and public holidays. I think the price is fairly reasonable given the location right smack in the middle of Orchard Road. If the Brunch menu is not to your fancy, there is also the Breakfast Menu which includes the likes of the ubiquitous English Breakfast, Toast and Free Range Eggs done to your preference. The one part of a menu which never fails to excite me is the Coffee menu. I would highly recommend something from The Providore Coffee as the beans are roasted locally and supplied by the highly credible Toby’s Estate. 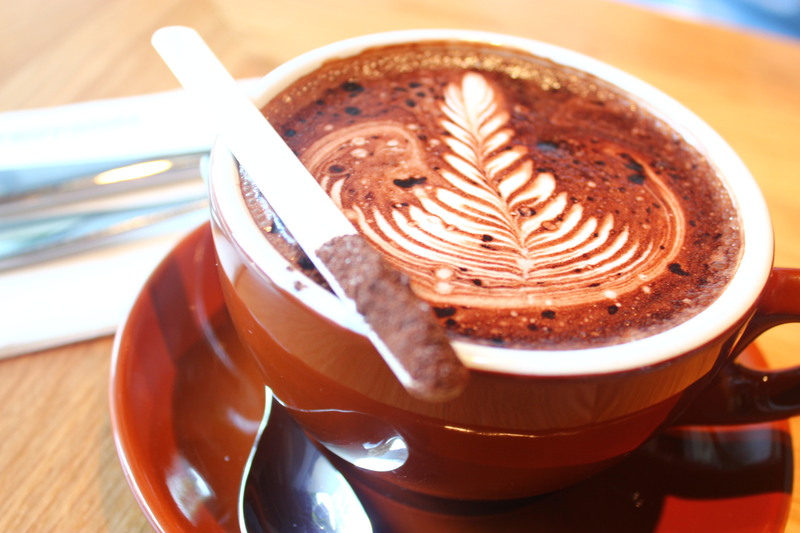 To start the post sweetly, we could not resist The Providore Hot Chocolate ($6.50) as it was screaming to be ordered on the menu. Indeed, the presentation itself is deadly. As though the chocolate does not look thick enough, there is also an additional dose served on the ice-cream stick. We do not doubt that this must be the sweetest (for good or bad, depending if you have a sweet tooth) hot chocolate we have ever had. A must try for all chocolate junkies. I decided on the Mochacino ($5), which comes in a smaller cup than the hot chocolate. This is probably the best of both worlds. I get to satisfy my caffeine and cocoa addiction in one go. The sweetness is just right, not to mention the aroma of the coffee. Quality is guaranteed by Toby’s Estate coffee beans. From the breakfast menu, I went with the English Breakfast ($19.50) as I was craving for variety. Poached Eggs seem to be my favourite option most of the time, if I have a choice. I have to specially mention the Sourdough Toast as it is really good! Spread the butter over the toast and the taste is amazing. I am not sure how the grilled Bacon is done as it has a tinge of the traditional Bak Kwa (Chinese Barbeque Pork) taste, which I like it alot. And we just have to try something from the Brunch Specials – the Grilled Portobello Mushrooms ($16.50). The almost perfect match between the goat cheese, mushroom, eggs and asapargus made this one of the best brunch tRP had in awhile. tRP could almost felt the effort the chef have made to the dish to ensure this ain’t just one of those trendy brunch places in Singapore as it sends a subtle message of …….we mean business. Rants The limited seating capacity will be a real challenge (an an irritation) to The Providore. Spaces are very limited and we can foresee a long waiting queue and time very soon. There is still some teething problems with the service, but this is probably forgivable given that it is newly opened. For instance, we were not shown to our table even though there is a sign that says so. Upon billing, the cashier mixed up our bill and only got it right after the third time. Will I return again? We love brunches though it is a little overrated these days. But it has been some time since we had one which left a lasting impression on us. I can’t wait to try the dinner menu already. Till our next visit. Watch out! Great post! I shall be visiting Providore soon. Maybe on a quiet afternoon for brunch! Thanks! Check it out soon before it becomes too packed! We enjoyed the food thoroughly. I had lunch with some girlfriends 12 May 2016 at Raffles Place and the bill came to $114 which I paid by Visa. We left and after 15 minutes I had an alert from Visa that I was charged $1,114. It was only fortunate I had not left the country and went back to the restaurant. They voided the $1000 and a sorry was all I got. This is totally unacceptable and I hope your establishment will not take this lightly. I have sent an email to the organisation and received deafening silence! Wow that’s a big error! We have not been back to Providore for very long, always pays to check your credit card receipt on the spot!